You'll believe Charles Bronson is back from the dead...Or not. It's hard to say how ethical it is to keep pumping out new action movies with a spot-on Charlie lookalike, but Robert Bronzi is certainly making a career out of it. 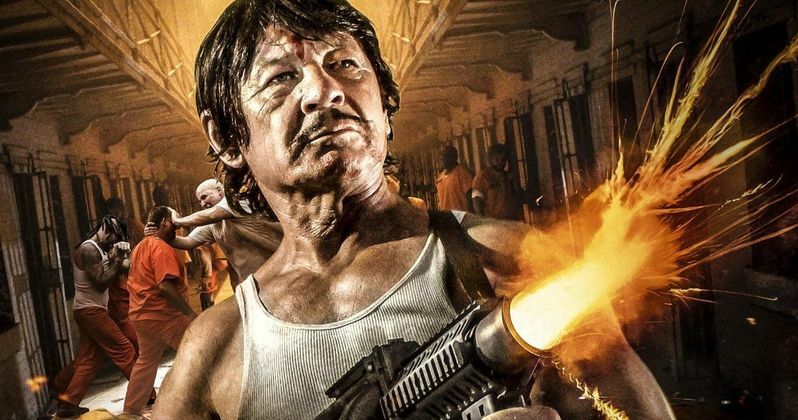 We have the first official trailer for his latest action thriller Escape from Death Block 13. And if you squint really hard, or quick chug a couple shots of shoe polish, you'll believe you're actually watching a long lost action masterpiece starring Charles Bronson himself. "Bronzi is back!" Screams the tagline on Escape from Death Block 13, which is a solid throwback to the gritty action thrillers of yesteryear. It perfectly recalls John Carpenter's Assault on Precinct 13 and Charles Bronson's own Death Wish. The new prison action feature stars Robert Bronzi, who was last seen in Death Kiss. And he's obviously changed his name to give himself more of a Bronson vibe. Like he needs it with that face. Also starring in this action thrillride is Nicholas Turturro (BlacKkKlansman, NYPD Blue), and Lawrence Hilton-Jacobs (Welcome Back Kotter, Rob Zombie's 31). Gary Jones (Axe Giant: The Wrath of Paul Bunyan, Xena) is directing this sure to be cult classic from his own screenplay. Mosquito Entertainment, Millman Productions, and Ron Lee Productions are the production companies. Octane Entertainment is handling foreign sales. The filmmakers are courting domestic offers. Escape From Death Block 13 concerns a wrongfully convicted man who discovers sinister goings-on at a maximum security prison and must break out to expose the corruption and get revenge on those who put him there. The movie shot recently at the notorious Ohio State Reformatory, where such movies as The Shawshank Redemption and Escape Plan 3 also filmed. "Bronzi" gained notoriety with the recent Death Kiss, for his uncanny resemblance to another tough and well-known action star of the '60s-'90s. It should be noted that the press release for the upcoming action thriller refuses to name Charles Bronson. But who else could they even be talking about? The guy doesn't look like Clint Eastwood or Lee Marvin. But speaking of those two, maybe Bronzi can take on a musical next, and bring this whole thing full circle. Also appearing in the Escape From Death Block 13 cast are Chris Hahn, Debbie Scaletta, Tim Lovelace, Lyindaa Russell, and Justin Hawkins. The film is produced by Jones and Philip R. Garrett. Jeff Miller (Death Kiss, Clowntown) and Ronnie D. Lee (The Toybox, Oujia House) are other Executive Producers. George J. Merino and Kathleen Jones are Co-Producers. Chris Hahn is Associate Producer. Ken Stachnik is Cinematographer. David H. Greathouse and Beki Ingram handle makeup FX. David Kirst is Production Coordinator. The film is aiming for a late 2019 release.